Since intervening militarily in Syria early last fall, Moscow has helped Bashar al-Assad shore up government control over vital parts of Syria. Middle East expert Juan Cole looks at Russian president Vladimir Putin’s major military and diplomatic successes since entering into the Syrian fray. Russia is so far winning big in Syria, and making Moscow’s projection of force in the Middle East a reality that the other great powers have to recognize. As Russia has emerged as a major combatant against Syrian al-Qaida and against Daesh (ISIS), it is being accepted back into a Europe traumatized by two major attacks on Paris. France is signaling that it hopes to end sanctions on Russia over Ukraine by this summer. While the Minsk peace process is going all right, the motivation here is to ally more closely with Moscow against Muslim radicals in the wake of Russia’s successes against them in Syria. Russia’s intervention in Syria last October was in many ways a desperate measure and a gamble. It is said that in mid-summer of 2015, Iranian special forces commander Qasem Soleimani flew to Moscow with a blunt message. The Syrian regime was going to fall if things went on the way they were going and Iran did not have the resources to stop it. Vladimir Putin, still smarting from having lost Libya as a sphere of influence, was determined to stop the fall of Syria. 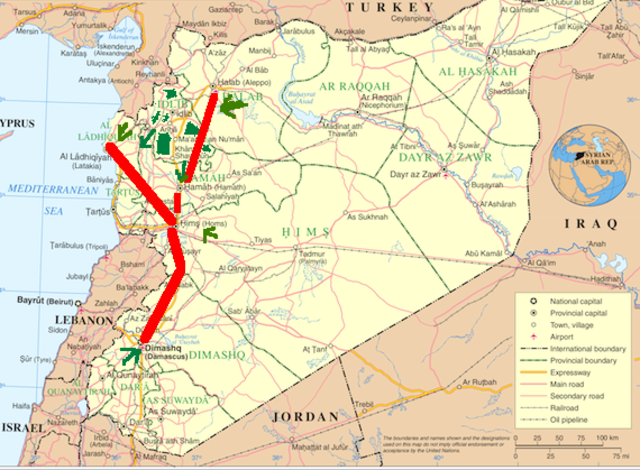 The regime of Bashar al-Assad has to control a Y-shaped area and set of transportation routes if it is to survive. The “Y” is anchored at the bottom by Damascus, the capital. In its metropolitan area, given the shifting population, live around 5 million Syrians who are afraid of the two major forces battling the regime, al-Qaida (the Nusra Front) and Daesh (ISIS). The trunk of the “Y” stretches up to Homs and then veers off to the left, to the key port city of Latakia. The right branch of the “Y” goes up through Hama to Aleppo, a city of 4 million before the war, which is divided in half, with the west in the hands of the regime. Controlling this huge “Y” where 70% of Syrians live is a tall order. It is vulnerable at several key points, of which the rebels have attempted to take advantage. 1. Daraa province to the south of Damascus is largely Sunni and rural and its clans could sweep up and take the capital, with Jordanian, U.S. and Saudi support. If that happened, game over. 2. The Army of Islam, backed by Saudi Arabia, has strong positions besieging the capital just to its north. If it could come down into Damascus, game over. 3. If the rebels could take and hold Homs and Qusayr in the middle of the “Y,” they could cut Damascus off from resupply by truck from the port of Latakia. 4. If the rebels, who took all of Idlib province in the northwest last April, could move west from Idlib and take Latakia, they could cut Damascus off from its major port and deny it ammunition, arms, even some foodstuffs. 5. If the rebels could move from south of Aleppo to cut off the road from Hama and strangle west Aleppo, they could take all of the country’s largest city, making it difficult for the regime to survive. Along this Y set of trunk roads, the most effective fighting force has been al-Qaida in Syria, which reports to 9/11 mastermind Ayman al-Zawahiri. This affiliate, called the Support Front or the Nusra Front, is formally allied with other Salafi jihadis in the Army of Conquest coalition and is tactically allied with many small groups in what’s left of the Free Syrian Army. The CIA has sent medium weaponry, including TOW anti-tank weapons, to 30 “vetted” groups in the FSA, via Saudi Arabia. Many of these weapons have made their way into the hands of al-Qaida and been used against regime tanks and armored vehicles to devastating effect. When Soleimani went to Moscow, it seemed that the road from Hama to west Aleppo had been lost and Aleppo would fall. Al-Qaida had also made advances in the south, taking al-Sheikh Miskin just south of Damascus, and preparing for a push on the capital. Idlib had fallen and Latakia might well have been next. So when Putin sent in his air force, it concentrated on protecting the red “Y” in the map above. It mainly hit al-Qaida, the primary threat to regime control of the Y, but also struck at Free Syrian Army groups backed by the U.S., Turkey and Saudi Arabia, which were tactically allied with al-Qaida. This move was necessary to defend the “Y.” It drew howls of protest from Washington, Ankara and Riyadh demanding to know why Russia wasn’t instead targeting Daesh/ISIS. The answer was simple. Except at Aleppo and at a point below Hama, Daesh for the most part posed little threat to the “Y.” Al-Qaida and its allies were the big menace, so Putin concentrated on them. Air support to a determined local ground force can be an effective strategy. It worked for Bill Clinton in Kosovo. It worked for George W. Bush in Afghanistan in 2001, when the U.S.-backed Northern Alliance handily defeated the Taliban. It worked again in March–April 2003, when U.S. air support to the Kurdish Peshmerga guerrillas allowed them to defeat the Iraqi Baath army in Kirkuk, Mosul and elsewhere in the north. And so this strategy has been working for Putin. He appears to have rearmed and retrained the Syrian Arab Army, which has new esprit de corps and is making significant headway for the first time in years. It is of course aided by Hezbollah, over from Lebanon, and by a small contingent of some 2,000 Iranian spec ops forces (many of them actually Afghan). So what has the Russian air force accomplished? 1. It allowed the reopening of the road from Hama to west Aleppo, ending the siege of that regime-held part of the city and pushing back the rebels from it. 2. It retook most of Latakia province, safeguarding the port. Yesterday came the news that the major northern al-Qaida-held town of Rabia had fallen to the government forces, meaning that Latakia is nearly 100% in government control. These advances into northern Latakia involved hitting Turkmen proxies of Turkey, which is why Turkey shot down a Russian plane last fall. Likely the next step will be to take back cities in Idlib like Jisr al-Shughour, which fell last spring to an al-Qaida-led coalition, and which could be used as a launching pad for the taking of Latakia port. 3. It strengthened regime control of Hama and Homs, ensuring the supply routes south to Damascus. 4. It hit the Army of Islam as well as al-Qaida and Daesh around Damascus, forcing the latter two to withdraw from part of the capital and killing Zahran Alloush, leader of the Army of Islam. 5. It hit al-Qaida and FSA forces in Daraa province and yesterday the key town of al-Sheikh Miskin fell to the Syrian Arab Army. This is a Daraa crossroads and its loss affects the rebels’ ability to maneuver in this province. The Russian air force, in conjunction with Syrian troops and Hezbollah and a few Iranian Revolutionary Guards Corps fighters, has therefore profoundly braced regime control of the “Y” where most Syrians live and along which the capital’s supplies flow. If in July through September it appeared that the regime could well fall, and quickly, now al-Assad’s minions are on the march, pushing back their opponents. It shouldn’t need to be said, but I want to underline that the above is analysis, not advocacy. Be that as it may, in the past four months, Putin has begun winning in Syria, which means so has al-Assad. And the spillover effects on Russian diplomacy are huge. This article was originally published on Informed Comment and is reprinted here with permission.